Our six minute custom timeline video covers all aspects of ticket price changes beginning with Disney’s opening and going through today’s tiered pricing system. 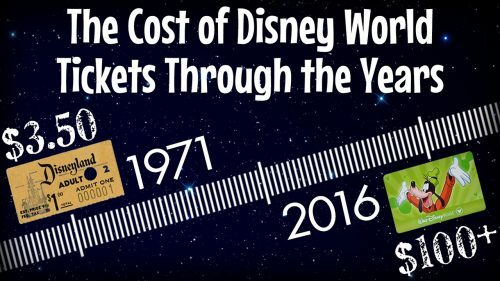 HotelsCorp, a recognized name in the discount vacation packages market and creators of the Orlando Destination Guide website, announced the launch of its Disney World ticket cost timeline video and blog post, intended to educate those researching the cost of Disney World park tickets. The six minute custom timeline video covers all aspects of the ticket price changes, beginning with Disney World’s illustrious grand opening and going through today’s tiered pricing system. Moreover, say industry experts like Forrester, these are changes in the price of a product that has also changed dramatically. In some respects, it is believed that the Disney World of today, especially taking into consideration the Epcot facility and other modern-esque venues, would be unrecognizable to a park visitor in 1971. This is a familiar problem for inflation trackers, who have had a difficult time weighing improvements in a product over time. For some commodities such as gasoline, this isn’t an issue, but it is for items like computers, refrigerators, cell phones and cell phone service, which have become more powerful or efficient over the years – or even cheaper.